I believe we produce the best Hoosier Cabinets money can buy. Original Hoosier cabinets are getting harder and harder to find. If you purchase a Hoosier cabinet from us, you'll cherish your Hoosier cabinet as a wonderful family heirloom. The word Hoosier Cabinet has become somewhat of a generic term representing all antique and reproduction cabinets similar to the original Hoosier cabinets built in the early 1900's to about 1930. I've been building reproduction Hoosier cabinets for about 11 years and I'm pleased to have been featured in several major magazines. We've also built Hoosier cabinets for companies such as Lehman's Hardware in Kidron Ohio. Thanks four visiting our site! Watch Us Build a Hoosier!! Order a custom project with us and we'll record it's creation! You'll enjoy watching us work through all the little difficulties custom projects can create. The custom components of your project will be photographed and posted on our website from start to finish. We're excited about sharing the wood-working experience with you! Also...Our own "On-line Reality Show" Featuring YOUR Custom Project! NEW! COUNTER TOP HOOSIER CABINETS???? 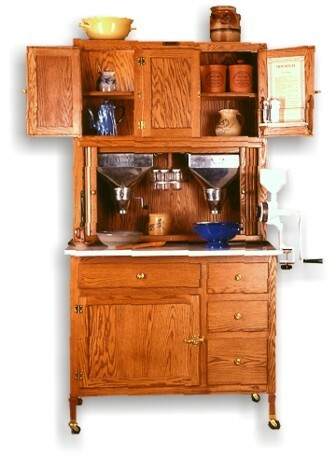 NOTE: After building Hoosier reproductions for over 15 years, we are currently no longer building these cabinets. Please feel free to check out our site for ideas and information regarding these great cabinets.